The film opens in Tianamen Square, a place whose name will be written in blood. A suitable opening place for a film about the implacability of misused power, and the way governments in the East and West use statistics to justify unjustifiable actions. Robert King's screenplay for Red Corner was inspired by an incident in his own life. He and his sister were travelling by train through Italy when two police officers tried to arrest her in the middle of the night. They knew no Italian and the officers knew no English and it was this case of mistaken identity that made King re-evaluate the arrogance of American tourists and realise how helpless they really are when faced by a foreign legal system. Originally King set his story in Russia, but after switching the location to China, he interviewed Chinese lawyers and toured the Beijing court system to research the film. Setting the film in a pragmatic totalitarian state emphasises the difference between the protagonist's expectation of a legal system and that which he faces. 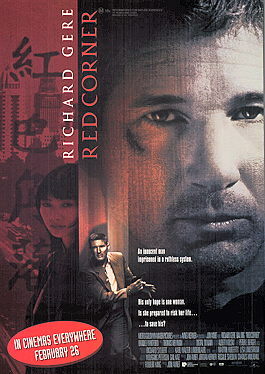 No doubt the poor in the U.S. feel just as helpless as Richard Gere's character in Red Corner. He plays a cocky American corporate type who is confronted by a system he doesn't know, conducted in a language he doesn't understand, run in a country that respects order over compassion. In any system, being uninformed in a situation out of one's control is terrifying. Jack Moore may be outraged by a system where the cost of the executioner's bullet is charged to the prisoner's family, but he does concede that neither is his native system perfect. This is one of the strengths of the film, that it does not make all American's heroes and all Chinese villains. China has a lower crime rate and a speedier legal system than the U.S., but its citizens pay for this by living under an implacable, inexorable system. The American embassy decries the situation saying, "This has the makings of a full-scale incident". They see needs of the buck-makers is higher than that of one man. Being a capitalist, being an American, Moore discovers, is not a mantle of invincibility. When Jack Moore is accused of murdering the young model with whom he spent the night, his state-assigned lawyer Shen Yuelin (Bai Ling) automatically pleads him guilty. She is scornful of his morals, and does not believe in his innocence. In the course of the film, the two learn to trust and respect one another, and to make sacrifices for one another . Jack Moore learns more about the China of the people, far different from the hallowed rooms in which he had been doing business. Red Corner was a technically difficult film to make, largely because its lead was banned from the location of the film. The film makers got around this by guerrilla filming sessions with Bai Ling in China, and by shipping a container load of chinese objects back to the U.S. where they built a section of Beijing for the shoot. 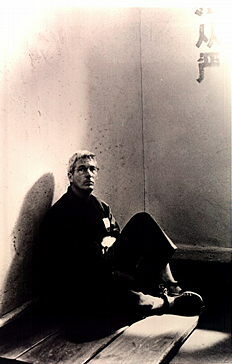 Richard Gere is well-known for his stand against the genocide and other anti-human activities of the Chinese government. Other actors in the film performed despite possible repercussions against their families in China. Red Corner was for many a labour of conscience, a statement that they felt they had to make. 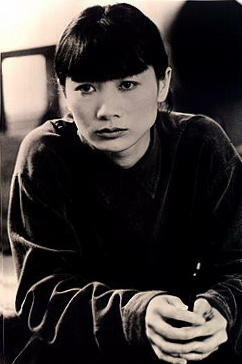 Bai Ling's simple statement that she must speak out is a reflection of the theme of the film. Her performance is the highlight of Red Corner, and if nothing else comes of this film, it will have served to introduce film goers to a rare talent. Edited by: Peter E. Berger, A.C.E. Director of Photography: Karl Walter Lindenlaub, B.V.K.